"Rising Above — Rohwer Reconstructed: Interpreting Place through Experience," a digital project and website, received the Outstanding Achievement in Preservation Education award in the 2018 Arkansas Preservation Awards. FAYETTEVILLE, Ark. – The Department of Landscape Architecture in the Fay Jones School of Architecture and Design at the University of Arkansas has earned a 2018 Arkansas Preservation Award for its work documenting the experience of Japanese-Americans in the Rohwer Relocation Center during World War II. The digital project and website, "Rising Above – Rohwer Reconstructed: Interpreting Place through Experience," received the 2018 Outstanding Achievement in Preservation Education award from Preserve Arkansas, a nonprofit advocate for historic preservation in the state. In addition, Preserve Arkansas honored two Fay Jones School alumni with the 2018 Parker Westbrook Award for Lifetime Achievement, the organization's only award for achievement in preservation over a period of years. Preserve Arkansas recognized all 2018 Arkansas Preservation Awards recipients at a Jan. 25 event held in Little Rock. Bob Kempkes and Anthony Taylor both graduated in 1979 with Bachelor of Architecture degrees. Since founding Taylor/Kempkes Architects in Hot Springs in 1986, they have worked to preserve the state's built environment and revitalize downtown Hot Springs. Notable projects in Hot Springs include the restoration and/or rehabilitation of the Mountain Valley Spring Company Building, the Old Post Office, the Quapaw Bathhouse and the Thompson Building. The "Rising Above" website brings together archival materials, timelines, interactive maps and a three-dimensional visual reconstruction to tell the story of the Rohwer Relocation Center in southeastern Arkansas. Some 8,500 Japanese-Americans lived in the center from 1942 to 1945. The digital project aims "to bring the Rohwer Relocation Center 'back to life' through the creation of an online, immersive digital environment that integrates material culture, oral history, photographs and documents — bringing them together to create a sense of a lived place," according to the website. Kimball Erdman, associate professor of landscape architecture, and his students worked with the Center for Advanced Spatial Technologies at the university to create the website. The project team joined with institutions throughout the state to expand existing online archives and gather them in one place. Collaborators include Arkansas State Archives, Arkansas State University, the Butler Center for Arkansas Studies, University of Arkansas at Little Rock's Center for Arkansas History and Culture and Special Collections at the University of Arkansas Libraries. Grants from the Japanese-American Confinement Sites grant program of the National Park Service, awarded in 2013 and 2015, made the project possible. About 120,000 Japanese-Americans were forcibly removed from their West Coast homes and relocated to detention centers after the bombing of Pearl Harbor in 1941. Ten detention centers were built in all; two were located near the southeast Arkansas towns of Rohwer and Jerome. The physical structures are largely gone, but the stories remain, preserved in photos, letters, oral histories, newspaper clippings and other material housed in Arkansas historical archives and museums — and now the website. The digital project has four main components — a digital archive of objects and historical documents housed in various Arkansas institutions; an interactive timeline that ties events at Rohwer to the larger historical context of World War II; a series of interactive maps depicting the physical, social and functional contexts of the site; and a three-dimensional visual reconstruction of one of the residential blocks as it might have appeared in the later years of the camp. The Center for Advanced Spatial Technologies (CAST) took the lead in writing grants and coordinating team efforts, as well as tackling the technical aspects of the project. Erdman and nine students did most of the research. Many of those students started work on the project during a spring 2014 class in Historic Landscape Preservation. Erdman subsequently hired students as research assistants to continue the work. "We looked at a lot of primary documents of all types — records, photographs, film footage — to try and piece together what the camp would have looked like from 1942 to 1945," Erdman said. 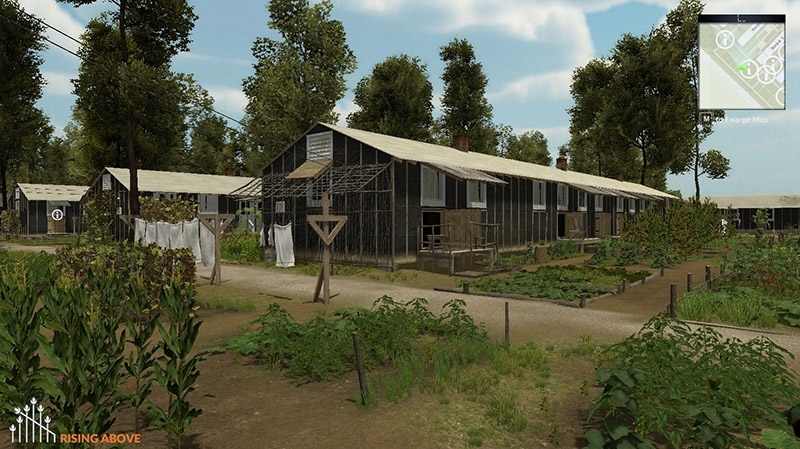 The three-dimensional visual reconstruction depicts a typical barracks block in the summer of 1944, the peak of occupation. The team chose a block that was partially wooded and partially open to show both conditions at the camp. Angie Payne, a research assistant at CAST, served as project manager and lead three-dimensional artist for the website. She used modeling and gaming technologies to translate the two-dimensional plans furnished by Erdman and his students into three dimensions. The result is a guided or self-guided virtual tour of the barracks block, with stops in the mess hall and a barracks apartment. There are no people in the three-dimensional visual reconstruction. That choice was purposeful, Erdman said, made both to protect internees' privacy and to focus attention on the role of landscape and the physical environment in portraying the story of the camp. "We're there to tell the story of the people and their lives, but we do that by depicting the landscape," Erdman said. "It's the landscape that tells the story of the people." The first internees arrived to a barren, military style camp built on 500 acres of Mississippi River Delta swampland, Erdman said. Internees quickly began to change the landscape, planting victory gardens and flowerbeds, as well as adding front porches and back decks. The resiliency shown by internees helped give the website its name, "Rising Above." "We saw this tendency to make the best of a bad situation, both on the part of Japanese-Americans incarcerated there and also camp administrators," Payne said. Some administrators went out of their way to order additional supplies, write letters of recommendation for college students and form friendships with the internees, she said. "You see this story of hope and compassion." The project team hopes to expand the website to include information about the Jerome Confinement Center - another reason for the more general title of "Rising Above." The team is working with ArkansasIDEAS, a program of the public television station AETN, to develop public school curriculum for the site. The goal is to integrate the website into academic units for Arkansas students in kindergarten through 12th grade. With its repository of primary documents, the website is a valuable resource for researchers and academics of all levels, Erdman said. He also hopes to reach former internees and their families with the project. The website will join other projects completed nationally under the Japanese-American Confinement Sites program, creating a digital database of resources to tell the story of Japanese-American confinement during World War II. "We're doing this for the internees, for their memory and for them," Erdman said. "We want to help raise public awareness of the historical importance of internment in Arkansas." Two other local projects honored during the ceremony were Shiloh Meeting Hall in Springdale and Methodist Manse in Cane Hill - both recognized for Excellence in Preservation through Restoration. A full list and details of the awardees from the 2018 Arkansas Preservation Awards are available at PreserveArkansas.org. For more information about Preserve Arkansas or questions about the Arkansas Preservation Awards, contact Rachel Patton, executive director, at 501-372-4757, rpatton@preservearkansas.org or visit PreserveArkansas.org.